"ALJ Essex issued a final initial determination (the 'Final ID') on January 13, 2012 finding that no violation of Section 337 of the Tariff Act has occurred [FOSS Patents post]. 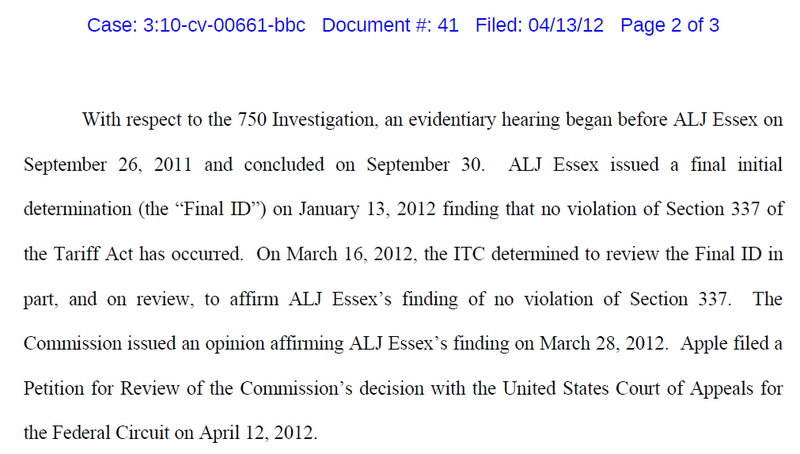 On March 16, 2012, the ITC determined to review the Final ID in part, and on review, to affirm ALJ Essex’s finding of no violation of Section 337. 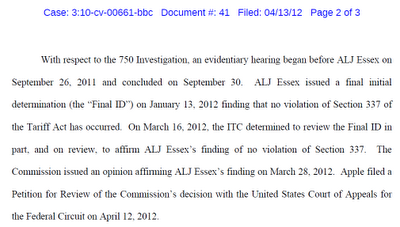 The Commission issued an opinion affirming ALJ Essex’s finding on March 28, 2012. Apple filed a Petition for Review of the Commission’s decision with the United States Court of Appeals for the Federal Circuit on April 12, 2012." In December, Apple appealed the unfavorable parts of the ITC's ruling on its first complaint against HTC. HTC also appealed the import ban that was ordered against all HTC Android devices implementing a certain feature ("data tapping"). That import ban will finally take effect this coming Thursday (April 19, 2012), though HTC removed the feature immediately -- a fact that shows that the ITC granted a far longer transitional period than necessary. There will likely be more appeals against ITC rulings in the months ahead. A couple of Android-related federal court decisions (interim decisions, not final rulings) have also been appealed to the Court of Appeals for the Federal Circuit (CAFC). In early December, Apple appealed to the CAFC a decision by the United States District Court for the Northern District of California to deny a preliminary injunction against four Samsung devices. On April 6, 2012, the CAFC held a hearing at which Apple restated the reasons for which it believes to be entitled to a preliminary injunction. Bloomberg's patent expert Susan Decker attended and reported on that hearing. And in February, the CAFC denied a Google petition to strike an incriminating piece of evidence, known as the "Lindholm email", from the Oracle case. That case is scheduled to go to trial (finally) tomorrow (Monday, April 16, 2012).